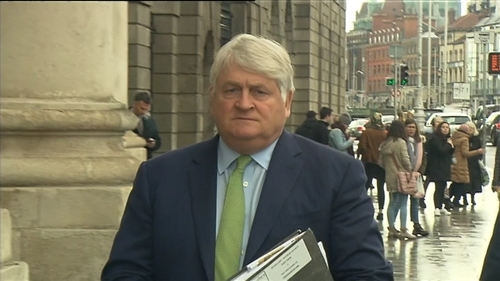 Businessman Denis O'Brien has begun giving evidence at the High Court in his defamation action against the Sunday Business Post. His lawyers told the jury they should award Mr O'Brien substantial damages to reflect the seriousness of allegations made in a number of articles in the newspaper almost four years ago. They also claimed the articles were published maliciously and presented in a lurid way and the jurors should also award aggravated damages as a result. Mr O'Brien is suing the Sunday Business Post over the articles published on 15 March 2015 giving details of a 2008 report by accountants PwC into Ireland's banks. He claims he was portrayed as someone who over-borrowed in a disturbing way, received cheap and easy money from the banks, and was facilitated by improper influence on bankers, politicians and who had tried to keep his identity as a substantial borrower a secret. His Senior Counsel Luán Ó Braonáin told the jury today that the articles about a so-called "gang of 22" men who had borrowed billions, destroyed Ireland and bankrupted the banks, made no distinction between good borrowers and bad borrowers. Mr Ó Braonáin said the newspaper referred to Denis O'Brien as someone who had very big loans from the banks and also said that he had repaid the loans and was one of AIB and Bank of Ireland's best customers. But he said this made up just 22 words in a series of articles running over several pages and finding these words was like finding a needle in a haystack. Mr Ó Braonáin said the jurors would have to decide what meaning a reasonable reader was going to take from the articles. He pointed to a headline on one of the articles about "the gang of 22". Mr Ó Braonáin said the word "gang" was usually used about a group of people acting together, who are up to no good. He told the jurors they might think of a "gang of thugs" and it was not language used to give an impression of something neutral. He said a reasonable reader would not read about a gang of 22 and think there was nothing to see here. The article named 22 people who were described in the PwC report commissioned by the Central Bank in 2008 as the banks' "top exposures at September 30 2008". The Sunday Business Post said it had identified Mr O'Brien as someone whose loans had been repaid and were performing, and that the word "gang" was simply used for a group of people. Mr Ó Braonáin said he had heard the theme tune to the movie "the Good, the Bad and the Ugly" this morning, but the article made no distinction between the good, bad or ugly borrowers. There was no meaningful distinction made between those who had been bailed out and those like Mr O'Brien who had repaid his loans. He asked the jurors if there was any way the reasonable reader could look at the articles and not get the impression that Mr O'Brien was one of the gang of 22. Mr Ó Braonáin also pointed out an article headlined "people of influence, people of blame". He said what was being discussed here was attributing responsibility for what had happened. Mr Ó Braonáin said the articles mentioned developers facing huge financial pressure in November 2008 and that many of them had left the taxpayer shouldering losses of billions of euro. He said it did not distinguish between the men, but lumped Mr O'Brien in with everyone else. He said it was difficult to see why this was done. Mr Ó Braonáin said the Sunday Business Post was claiming the articles did not have the meanings complained of by Mr O'Brien, but was not claiming the articles were true. He said the newspaper also claimed the articles were "fair and reasonable publication on a matter of public interest". Mr Ó Braonáin said this was not an appropriate defence in this case. Mr Ó Braonáin said such a defence only arose if a publication had got something wrong. He said it was not fair and reasonable to publish the articles in the way they had been published. He again drew attention to the fact that the articles had not distinguished between different types of borrowers. Mr Ó Braonáin told the jury of eight men and four women that if they decided the articles meant what Mr O'Brien claimed they meant then they were false and defamatory allegations as there was no defence of truth. He said the article was published more than six years after the PWC report had been compiled and asked what the urgency was to publish it. He said no comment had been sought from Mr O'Brien before publication. Mr Ó Braonáin also said that journalist Tom Lyons had caused his copy of the report to be shredded to protect his source and it was impossible for the jury to decide if the publication had been fair and reasonable publication in the public interest by reference to a report that had not been produced. In his evidence, Mr O'Brien said he was the "odd man out" in the Sunday Business Post articles because the other people mentioned were property developers and he was not. He said he first saw the paper on the day it was published as he left mass in Donnybrook. The man he bought the papers from showed him the Business Post and said "I see you're in the paper". Mr O'Brien told the court he said to himself: "How did they put me into this?" He said he visited his mother and father who opened the door and told him he was now being blamed for the banking crisis. Mr O'Brien said his interpretation was that the articles were an expose about some files relating to people who'd borrowed money. He said they had put him in with property developers and he was the odd man out. He said he had no relationship with the other 21 people mentioned as a group, although he would have known some of them. In November 2008, when the PwC report was compiled, Mr O'Brien said he was "fortunately", absolutely not a developer "creaking under the strain" as described by the newspaper. He said he had no exposure to development land of any kind in Ireland. Mr O'Brien said he should not have been in that "so-called gang of 22". He said he was repaying his loans and was in good stead with his banks. Any properties were held long term, he said. Mr O'Brien said he had been "lumped in" with the other 21 people. Most of them had development land and with the collapse of the market they had found it difficult to pay their loans - they were very, very challenged. He said the articles were blaming 22 people for having to be rescued by the bailout. He suggested his name had been thrown in on the front page to sell newspapers. Mr O'Brien said he certainly never got cheap and easy money from any bank in Ireland. He was a substantial borrower, he said, but he always had to pay up and did not get preferential treatment. He said he felt very bad when he read about the 22 people being developers who were under pressure and shouldering huge losses because it wasn't true in his case. Mr O'Brien said people reading the articles would have had a lot of questions as to why he was involved. He got his solicitor to write to the newspaper and ask for an apology, but he said that was refused. Under cross-examination by Senior Counsel, Michael McDowell, for the newspaper, Mr O'Brien said he believed that the term "developer" was a defamatory term in Ireland in 2015. Mr McDowell asked him about a number of property investments he or companies owned by him had made. Mr O'Brien agreed a company that holds properties on behalf of him and his wife had bought a two-storey premises in the middle of Donnybrook in Dublin 4 in 2000 and applied in 2005 for planning permission to build a 26-storey apartment block. But Mr O'Brien said this did not constitute speculative development as he was not going to sell the apartments, but intended to rent them out. He said there was a difference between people who bought large swathes of land and intended to develop it and buying a small site to hold onto. Mr O'Brien also agreed that he had bought a building on St Stephen's Green in 2000 and knocked it down and redeveloped it in 2014. He said he had invested €40m in the last 18 years in his Portugese holiday and leisure facility, building roads, infrastructure, a new golf course and sports campus. Mr O'Brien also agreed that he bought Doncaster Rovers football ground in England in 1998. He said he had been waiting for the opportunity to go for planning permission, but ultimately did not. He said it had subsequently been sold, but denied this constituted speculative development. The cross-examination will continue tomorrow.